Daikaku (Prunus 'Daikoku') is a delighful small Japanese flowering cherry tree with strong ascending branches and unusual showy creamy-white, semi-double flowers with green and pink shades. 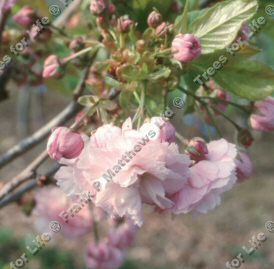 Quite similar to Prunus Ukon, however, this tree flowers later. A small height tree, so expect a height of up to 4 metres (13 foot) after 10 years. Grows to be a vase type shape e.g. narrow at the bottom and expanding out towards the top. Daikaku is supplied at a height of between 1.5 and 2.0 metres in a 7-12 litre container for year round planting and better results than from either bare-root or rootballed stock.